I’ve made my own ginger ale a few times now. It’s surprisingly easy to make your home-made soda. Before you start, you’ll want to make sure you have some proper bottles to put your soda in. You could bottle the soda in regular beer bottles if you have the equipment.You’ll need clean beer bottles, caps and a capper that you can get at your local home brew shop. If you’re in the Lancaster area try Mr. Steve’s Homebrew or Lancaster Homebrew. There are also tons of places online to get home brewing supplies. I like to use swing top bottles that have a rubber seal. It’s easier than bottling using caps and the bottles that I use are clear so you can see the soda. Remove the skin from the ginger root, cut it in small pieces, place it in a food processor and shred the ginger until it is very finely ground up. Place the ground up ginger root, 1 cup of sugar, and 1 cup of water in a small sauce pot and bring to a boil. Allow the mixture to boil until the sugar has dissolved, turn the heat off, cover the pot and allow to steep for one hour. After an hour, the syrup should be cool enough to handle. Use a piece of cheese cloth to strain the syrup into a clean jar. Squeeze any juice out of the left over pulp that you can by twisting it in the cheese cloth. You can use this syrup for more than just the soda. You could mix a little bit into your maple syrup to serve on top of waffles. It’s nice to add a little on top of vanilla or honey ice cream, or if you have an ice cream maker… you can use it to make your own ginger ice cream. Mixing it into fruit salad can add a new twist to a simple dessert. You can use it in anything where you would use simple syrup, great for cocktails! To a clean 1 liter bottle, add 6 oz. 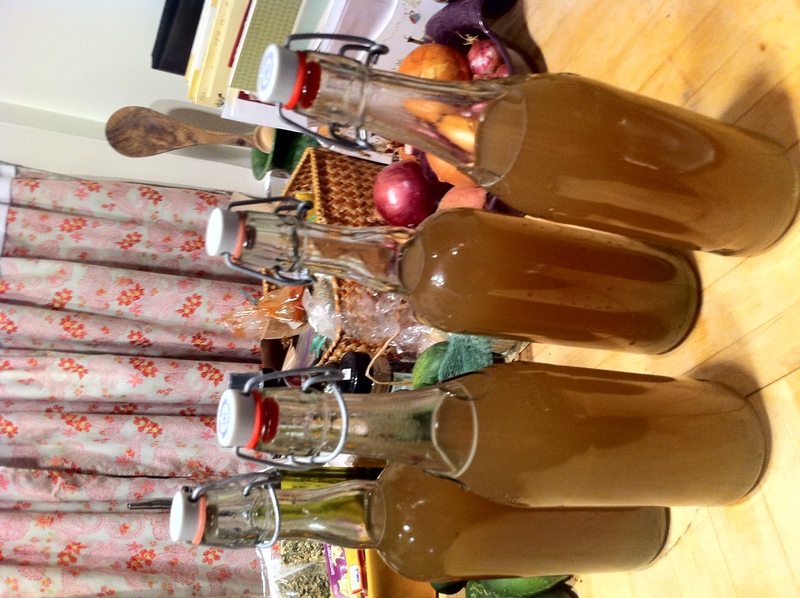 of the ginger syrup and a pinch (about 20 granules) of champagne yeast. You can find champagne yeast at the home brew store for pretty cheap, you can also use bread yeast if you really can’t find it but I do not think it works as well. Fill the bottle up to the bottom of the neck with filtered water. It’s important to leave a little space so you don’t have too much pressure build up in the bottle. Once the yeast starts working, carbon dioxide gas will be produced. Leave the bottles at room temperature for 48 hours. After 48 hours you can place your bottles in the refrigerator. The refrigeration will stop the yeast from producing carbon dioxide. I have read a lot of warnings that bottles can explode if you add too much yeast, leave it at room temperature for too long, or fill the bottle too much. I have never had this happen to me, but just be aware that it is a possibility. You could make a great Dark and Stormy with your home-made ginger ale or a very simple ginger and whiskey cocktail. Just add 1 oz of good quality whiskey to 8 oz of ginger ale -simple and delicious. 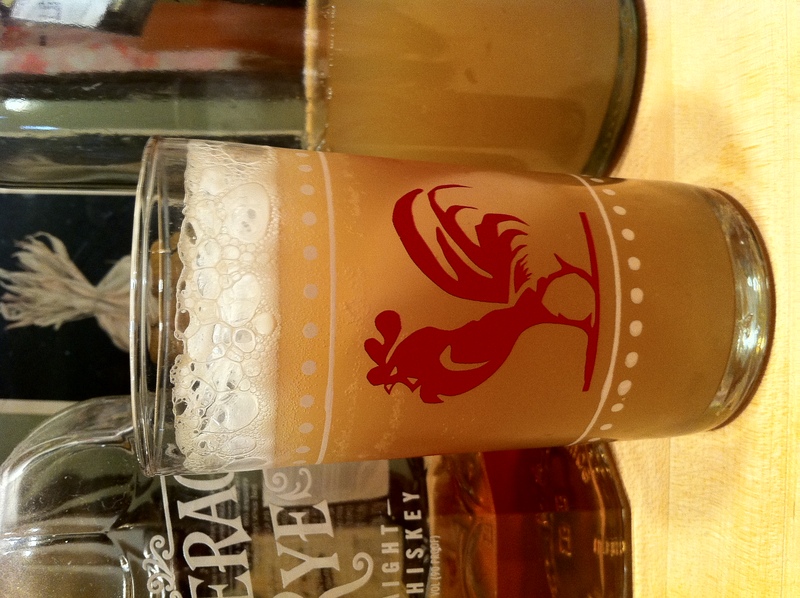 If you like the rooster glass, they came from pier one imports. I don’t think they have them any more but you could find similar ones here. I received my rooster glasses for my birthday one year from one of my very good friends. They are a perfect size for making a small mixed drink or serving up your morning glass of OJ. I have ALWAYS wanted to make my own soda. I’ve got a couple of swing-topped Lorina lemonade bottles lying around. Maybe I should try this for reals now. We love ginger ale in our house. Those bottles are great! They seal pretty well and are the perfect size. I have looked into buying them empty and they cost like $10 each… the lemonade is only $4 and you get the bottle.